I’m Natalie and live in a great countryside home perfect for dogs. We own two springer spaniels and walk them twice a day. We’ve also bred puppies successfully and were completely smitten with them all, so smitten we kept the runt of the litter and we treat him like a baby. I absolutely adore animals and have plenty of time on my hands to look after my own and others. I use the dog walking as exercise for myself so I tend to take them out for 30-40 minutes with plenty of play time along the way for the dogs. 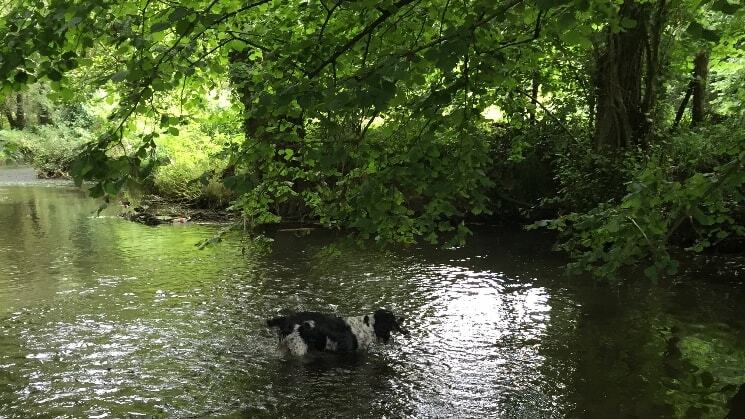 The river Hamble runs in the woods just behind our house so if your dog is into swimming they’ll get that too in the summer. The dogs are allowed to play freely inside my home too as it’s open plan and I absolutely love having them all cosy indoors after a winter walk. Looking forward to looking after more pooches in my home as they are more than welcome here. This truly is a doggie heaven, lovely property with plenty of safe outdoor space. Natalie and her family looked after my dog so much he didn’t want to leave. I could not fault Natalie in any way. Thank you and we will see you again very soon Natalie. Natalie is fantastic! Really lovely lady that makes you feel at ease leaving your pet. I got loads of pics of my dog whilst I was away, great communication & my dog Guga loved her! Nice spacious house with amazing outdoor space. Guga loved his daily walks with Natalie and her sweet dogs, Toby and Sophie!